Havana, Mar 26 (Prensa Latina) Cartoonists from 23 countries will compete at the 19th International Cartoonist Biennial to take place in Cuba from April 5th to 8th, jury president Reinerio Tamayo announced today. 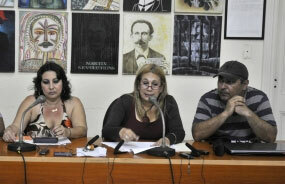 Cartoonists and comic writers from the Cuba’s Journalists Union and the Humor Museum in San Antonio de los Baños, are promoting the meeting between national and foreign professionals. The contest has received works of 93 artists from 33 countries, including Cuba, China, Uzbekistan, Germany, Argentina, Colombia, Egypt, Spain, Puerto Rico, Dominican Republic, Russia, Syria, Ukraine, Poland, Czech Republic, Estonia, France, Italy and Peru, among others. According to Tamayo, all genres will be represented, especially cartoons, personal caricature and political satire. The main themes chosen by the authors were peace, nonviolence, children’s innocence and nature. For the first time, cartoonists have referred to the improvement of Cuba-US relations, Tamayo added.